Vertical movements in south-western Fennoscandia: A discussion of regions and processes from the Present to the Devonian (R.H. Gabrielsen et al.). Metamorphic core complexes and gneiss-cored culminations along the Mid-Norwegian margin: an overview and some current ideas (P.T. Osmundsen et al.). Deep structure of the Mid-Norwegian shelf and onshore-offshore correlations: Insight from potential field data (J. Reidar Skilbrei, O. Olesen). Development of the Jan Mayen microcontinent by linked propagation and retreat of spreading ridges (R.A. Scott et al.). The role of East Greenland as a source of sediment to the Vøring Basin during the Late Cretaceous (A.C. Morton et al.). The Norwegian Sea during the Cenozoic (S. Henriksen et al.). Upper Cretaceous basin-floor fans in the Vøring Basin, mid-Norway shelf (E. Fjellanger et al.). Late Permian to Triassic basin infill history and palaeogeography of the Mid-Norwegian shelf - East Greenland region (R. Müller et al.). Early Triassic syn-rift sedimentation at Hold with Hope, Northeast Greenland (B.T. Oftedal, A. Andresen, R. Müller). Controls on depositional history and architecture of the Oligocene-Miocene succession, northern North Sea Basin (Y. Rundberg, T. Eidvin). 3D Cretaceous to Cenozoic palaeobathymetry of the northern North Sea (S.T. Wien, T. Kjennerud). Submarine slides on the Mid-Norwegian Continental Margin - A challenge to the oil industry (P. Bryn et al.). Occurrence and implications of large Lophelia-reefs (offshore Mid-Norway (M. Hovland et al.). Arctic Gas Hydrate Provinces along the Western Svalbard Continental Margin (M. Vanneste, S. Guidard, J. Mienert). Gas hydrate dissociation and sea floor collapse in the wake of the Storegga Slide, Norway (C. Berndt et al.). 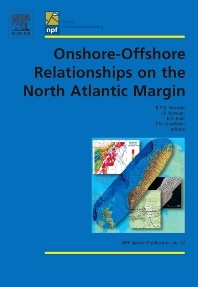 This book includes a selection of oral and poster presentations from "Onshore-Offshore Relationships on the Nordic Margin Conference" held in Trondheim in 2002. The conference was jointly arranged by the Norwegian Geological Society (NGF) and the Norwegian Petroleum Society (NPF), and attempted, through different thematic sessions, to bridge the gap often noted between industry and academic research. The first part of the conference included presentations under the theme "Basement control on offshore structuring" with representative articles from that segment included in this book and covering topics that range from analysis of vertical movements of basement substrates to the deep structural architecture of the Norwegian Sea to the development of the Jan Mayen microcontinent. These papers set the scene for the second segment of the conference, "Linking uplift and erosion with subsidence and deposition", that in the present book include articles related to the Triassic to Present-day infill history in the Norwegian and northern North Seas. The last segment of the conference addressed "New challenges" with respect to natural features of the deep-water areas that necessitate particular consideration and innovation on the part of research and industry to mitigate risk and maximize returns from field development. In this book, the articles addressing this theme present analyses of the enormous submarine slides that took place during the Holocene in the Norwegian Sea, and are of particular interest to the developers of the Ormen Lange gas field; other articles address the occurrences of gas hydrates in the near sea floor and the challenges presented in identifying and protecting the Lophelia cold-water reefs in the region.